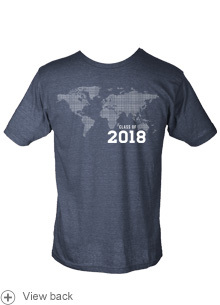 This shirt features Class of 2018 on the front, and Jim Elliot's inspiring quote "He is no fool who gives what he cannot keep to gain that which he cannot lose" on the back. From David Brookshire of Asheville, North Carolina on 5/1/2018 . From andrea geer of Siloam Springs, Arkansas on 4/7/2018 . From Anonymous of menifee, California on 1/31/2018 . From Anonymous of Monroe, Washington on 11/27/2016 .